For the Intel communications team: Compliments. In the storied company’s 50th-anniversary year, you dealt with the embarrassing resignation of a CEO and still credibly and colorfully conveyed the tech and cultural contributions of one of the most respected companies in business history. 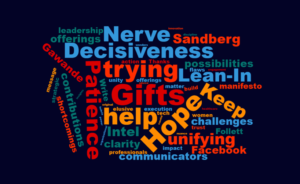 For communications professionals hungry for strategic impact: Decisiveness. Establish a point of view and a recommendation for action based on all available information and insights. Then be ready to adjust it (or abandon it) when the insights change. This saves time and gets to clarity faster—even if clarity doesn’t arrive till Plan B or C. And for communications leaders frustrated that their influence is diminished because they don’t (yet) report directly to the CEO: build a relationship of mutual trust and candid advice from wherever you sit. Advice can be ignored no matter how close, or embraced no matter how distant. For all those souls, in Indonesia or Yemen or South Sudan, or Puerto Rico or Appalachia, for whom the challenges above would be high-class problems, and gifts in themselves: Hope, and help. Two good places for the rest of us to start are Nicholas Kristof’s yearly offering and Peter Singer’s The Life You Can Save. For all of us: Keep trying.